Our collection of beautiful wood armoires offers some of the finest space-saving, free-standing furniture available today. Are you running out of space in your closet? Could you use a little more room for storage, but don't want to sacrifice the look of your bedroom? 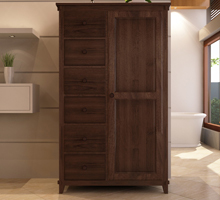 Our armoires are handsome, sturdy, and incredibly efficient ways to solve your space problem while enhancing the appearance of your home interior. Our armoires are built with only the highest-quality materials, including sustainably-harvested teak and mahogany woods. They are built by hand, so no two cabinets are exactly alike – but being built by hand does not mean that these armoires are in any way lacking in stability and durability. Each armoire is tested for its weight-bearing capacity before it is approved for sale. But our all-wood armoires are not just built for functionality and quality; they are designed to be elegant works of art in your home. Our Kobe armoire features a rich, warm face with elegant wood grain accents and wrought iron corner embellishments and handles. 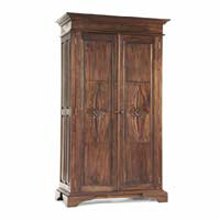 Our Tropical armoire has a deeper, more sophisticated and dark tone with beautiful framing and unique leg accents. Our Lotus armoire features beautiful floral engravings, carved by hand, that make for a lovely showpiece in any bedroom or office. Whatever you choose, we are sure you will love the look of your new wood armoire. If you have any more questions about our modern wood armoires, or would like some assistance in choosing the perfect new cabinet for your home, please contact us today! 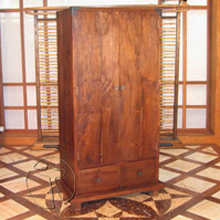 We promise you will love your armoire from Tansu.net.